Elected He was Elected in 1840; "Art. 58. To Hezekiah W. Foote, clerk of the circuit court of Noxubee county, for services rendered by him as such clerk during the years 1836, '37, '38 and '39, the sum of two hundred dollars." Military* Captain in Mississippi Cavalry, Company G, Noxubee Cavalry. Obituary* DEATH OF JUDGE FOOTE. Judge H. W. Foote died at his residence in Macon, on Sunday, Jan. 29th, aged eighty-eight years . He was among the oldest settlers in the county and participated in its organization. He held many offices of honor and trust. He was one of the first circuit clerks of the county, and took an active part in political campaigns before the war as a Whig. He was Colonel of the First Miss. Cavuliy during the civil war: was elected Judge of the judicial district and held that office until he was removed by Gen Ord for partisan reasons. He was Superintendent of the Methodist Sunday school here for fifty-six years; was a member or every general and annual conference of the cnurch until old age came upon him. He was one of the original members of the Methodist church in Macon, and attended regular when services were held in a frame building near where now the Episcopal church stands. The church was crowded at the burial service and it was intended that all the Sunday School children would march in procession to the cemetery, but this was prevented by the very inclement weather. He died peacefully in the presence of nearly every member of his large family. Judge H. W. Foote, jurist, soldier and planter, is a resident of east Mississippi, and in this section, which has long been the seat of wealth, culture and refinement; he has resided since early manhood. Although born and reared in Chester District, S. C., he was early attracted to this section by the fertility of its virgin soil, and having imbibed those principles of probity, honor and candor so characteristic of natives of the Carolinians, he was eminently fitted to occupy a leading position in whatever section he might settle, and especially so in a new country. Being pushing and enterprising in spirit, and possessing an inexhaustible fund of courage, he removed westward before he arrived at the age of manhood, and in the favored region of Macon, Noxubee County, Mississippi he cast his fortunes. Prior to leaving the state of his birth he had begun the study and prosecution of law under the direction of that distinguished attorney and jurist, Co. Z. P. Herndon, but being under age, he was not admitted to the bar until after he came to Mississippi. Soon after reaching his majority he became a candidate for clerk of the circuit court and so honestly, faithfully and capably did he discharge the trust that for eight years he was elected to this position by his admiring constituents. During the extended period that he filled this position it became a very lucrative one, worth from $5,000 to $6,000 per year, the flush times in Mississippi being then at their fullest flow. About this time a hot contest between Hugh L. White and Martin Van Buren was at its height, and Mr. Foote exposed the cause of the former with warmth and fervor of a true Carolinian. He remained an unswerving adherent of the old Whig party until it was succeeded by the Union party in 1851. He vigorously opposed the repudiation course of Mississippi, and acted with the bond paying party and supported successively Williams, Shattuck, Fontaine, Rogers and Clayton for governor upon this issue. Believing that the rights of the Southern states could be preserved in the Union, and that secession would but result in disaster, Mr. Foote opposed secession with all the fervor of his nature manhood, and probably made the last speech in opposition to it that was made in Noxubee County before the convention met that adopted the ordinance of secession. When the war became an assured fact, he was true to the principles he had imbedded in his youth, for, recurring to that period, it is found that when a mere lad of seventeen he was a volunteer in his native state under the Jeffersonian and Calhoun banner of nullification, and now has the commission which with was granted him Robert Hayne, governor of South Carolina, as first lieutenant of a volunteer company. When Mississippi seceded he was found ready to do battle for home, property and liberty, and as it was apprehended that there would be trouble with the Negros, Mr. Foote raised a company for home defense, composed of many of the best citizens of Noxubee, of which he was chosen captain. After the battles of Manassas, Bull Run and others, the Southern hearts were fired and the others, the Southern hearts were fired and the home company changed their name to the Noxubee cavalry, and marched to Tennessee to support General Cheatham and became an active part of the brigade, and participated in the bloody struggles at Belmont, Shiloh, etc. At the re-organization of the army in North Mississippi, Captain Foote was called home – where he had left his children without the protection of a mother even – by Governor Charles Clarke to take charge of and organize the militia in that part of the state, and after this had been done efficiently a large regiment of the cavalry, consisting of thirteen companies and over one thousand three hundred men, were ordered to elect their field officers. Mr. Foote was soon after informed that he had been unanimously elected colonel and although his services were needed by his family, he could not resist what he considered his country’s call and how well he performed his duties let the survivors of that splendid legion answer for him. In 1865, at the earnest solicitation of his numerous friends, he became a candidate for circuit judge, and although his opponent was one of the ablest and most popular judges of the state, he was elected, and for four years in this trying and responsible position he administered justice with an even hand and so satisfactory was his work that he was triumphantly re-elected over the same able and accomplished competitor. During his second term the reconstruction acts were passed by the Federal Congress, and during the pursuance of these measures Federal legislation became so inimical to Southerners who had participated as to render it unsafe for them to remain in state offices, and Judge Foote determined to resign his judgeship, and held his last term at Columbus, retiring from the bench two years before the expiration of his second term. The frequent affirmance of his decisions by the Supreme court attested his profound knowledge and astute judgement of the noble science of law and his career on the bench brought into play the versatility and superiority of his genius. He returned to his home in Macon and resumed the practice of law, devoting his mature energies to his work and to the supervision of his planting interests during the dark days up to 1875, but as this period of misrule became too heavy to bear, and the chains too galling to be longer tolerated or worn by men who dared to call themselves men, the leading citizens of East Mississippi led the whites to victory in the revolution of 1875, and Judge Foote was one of the foremost of this band. While a member of the While a member of tile State Senate from the district composed of Noxubee, Kemper, and Neshoba counties, he was fearless and frank in the expression of his views, and that he was an able legislator is attested in looking over the journals of the Senate. He is a staunch member of the Democratic Party, and is much more interested in local than in national politics. Although he commenced the battle of life at Macon with limited financial resources by attention to business principles, and successful law practice, he was the owner of one hundred slaves at the opening of the war in 1861, and cultivated one thousand acres of land. He also has a considerable amount of money at interest, making in all a comfortable fortune. The result of the war left him destitute, with the exception of his land and stock, and in the unsettled condition of affairs, even those of little profit, as many a fortune was lost in planting operations under the new regime. Besides his Noxubee plantations, Judge Foote's wife owned a magnificent body of land of about three thousand acres in Issaquena County, but it was left in ruins at the close of the war. Under his efficient management this magnificent property has been restored, and now over one thousand acres are in a fine state of cultivation, and make one of the best improved plantations on Deer creek. The Louisville, New Orleans & Texas railroad runs through his plantation at the lower part of which is a flag station, which makes it one of the most accessible and desirable of properties. Judge Foote also owns another splendid plantation on the same stream in Washington County, which has about five hundred acres under cultivation, and in connection with his son, Mr. Hugie L. Foote, owns a delightful settlement on Steel’s bayou, containing five hundred acres, nine miles east of Macon, is also his property., but his special pride is his stock farm, containing one thousand acres, situated on the west bank of the Noxubee river, two miles south of Macon. Judge Foote recognized the fact that to raise cotton profitably it was necessary to raise needful home supplies, and he is determined to devote one farm exclusively to stock, to supply meat and mules to his other plantations. Six hundred acres of this farm are devoted to pasture, and are finely adapted to the purpose for which they are intended. An artesian well affords pure and abundant water, the pasture abounds in native grasses and there is a considerable area in blue grass, orchard grass and also an abundance of lespedeza or Japanese clover. On this farm the Judge has demonstrated satisfactorily that stock raising pays. All necessary supplies for keeping the stock in condition during the winter months are raised on the farm, and every facility is used for bringing about good results, and as a result Judge Foote is one of the leading stockmen of the South. promising young lawyer, of Atlanta, Ga. The other sons live in Lowndes and Noxubee Counties, Capt. H. D. Foote, a planter in the former and Thomas Foote, a lawyer in Macon. Mrs. Foote died in l855 and two years later the Judge contracted a second marriage, his union being to Miss Mary Foote a cousin of his first wife and a supposed distant relative of his own. One daughter was born to them, Mollie Frances, who is also directly descendant from the Washington family, the mothers of the two wives being sisters. While in Macon in 1863 he met and married Mrs. Sybilla A. Messinger, relict of G. W. B. Messinger, and their union was consummated in December of that year and existed harmoniously for twenty years, or until the death of Mrs. Foote. She left one child, Miss Georgie, is a handsome and accomplished young lady. The above statements are taken from a sketch of Judge Foote in the Planter's Journal, of August, 1884, and may have changed in some respects. His daughter Miss Georgie is now the wife of Dr. W. M. Paine of Aberdeen son of the late Bishop Paine, of Mississippi. His last union was to Miss Eleanor W., daughter of Rev. W. M. Curtiss. For thirty years he was actively engaged in the practice of his profession with the exception of the time he was in the army and on the bench, but for some years has been retired from the practice of his profession and devotes his time to looking after his varied and engrossing interests, in visiting his children in their various homes, and in church and Sunday school work. Although somewhat advanced in years he shows but little the ravages of time, either mentally or physically, and has before him many years of usefulness to his fellowmen and pleasure to himself. He has a beautiful home, elegantly appointed and favorably situated, and here he dispenses hospitality with a generous and gracious hand. He is a member of the Board of Trustees of Vanderbilt University and is President of the Farmers and Merchants Bank of Macon, Miss. the Confederate army, died in 1875; Henry D. of Columbus, Miss., who was in the Confederate army, holding the rank of captain, and was imprisoned at Camp Douglas, Illinois; Thomas is a lawyer and is associated with his father, and was once Mayor of Macon, and Emily is the wife of Henry Patty, a lawyer of Atlanta, Georgia. Judge H. W. Foote practiced law in Macon, as shown in the foregoing sketch, and was also a planter in Noxubee and Sunflower counties up to the time of his death. He was president of the Merchants and Farmers Bank in Macon from about 1890 to the time of his death. He died in February 1899, and was buried in the cemetery at Macon. He is survived by one child, Mrs. Emmie Foote Patty of Atlanta, widow of H. M. Patty, who was a prominent attorney in Atlanta for many years preceding his death. There were numerous grandchildren. In fact every child left descendants, but to write them up would be rather a large task. Among them is George H. Foote, of Gulfport, Mississippi, who was Mayor of Gulfport for two terms. 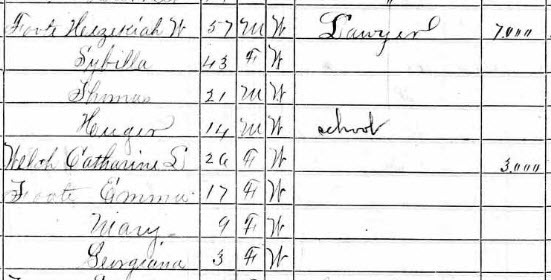 There are the Patty children of Macon, some of whom held public offices. 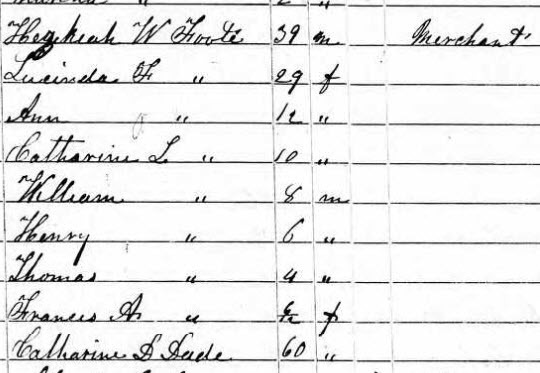 My father, H. W. Foote, was born in Chester District, South Carolina, December 1810. He left his home at thirteen years of age, going with James T. Harrison, of Columbus, Mississippi, but settled in Noxubee County, Macon, then a very small town - grew up with the place, and was always prominent in all things concerning the progress and the good of mankind. Married young Frances Lucinda Dade (great niece of George Washington). Nine children by this marriage. He fought for the Confederacy, was Colonel of the Home regiment. He was judge of the sixth judicial district, but resigned, not willing, to take the "Oath of Allegiance", which was required at that time for all office holders in the South. He was in the Senate at the time of the impeachment of Ames. I have the picture of that body of men, of which the state was so proud. He was superintendent of the Sunday school over fifty years. The Sunday school gave him a silver goblet on the fiftieth anniversary, which (he and mother) gave me before he died, as I was a worker and organist at that time in the church. He died in 1899. My father was one of the original trustees of the Vanderbilt University, appointed by Bishop McTyre when it was given to the M. E. Church South by Vanderbilt, and if they had taken his advice the church would still own it, but alas. My father was faithful in the discharge of the threefold duties incumbent on every citizen, viz: personal, to himself , his family and friends; civic, to his city, his county, his state and his nation, moral and religious, to his fellowman, his Sabbath school, his church and its institutions and to his God. [S3197] Chapman, C. Stuart; Shelby Foote A Writers Life, University Press of Mississippi, Jackson, 2006. [S3000] Glenn, Justin. The Washingtons, A Family History: Volume 1, Seven Generations of the Prsidential Branch: Savas Beatie LLC, CA - 2014, Personal Collection - printed book. [S83] Washington Family, John A. Washington, 17 November 1956. [S89] Tandy, Lura Boulton and John Meriwether McAllister. Genealogies of the Lewis And Kindred Families. Salem, Mass. : Higginson Book Co., 199. https://hdl.handle.net/2027/wu.89062355862, Hathi Trust Digital Library. [S3189] Abstarcts of Wills of Noxubee Co., MS., 1834 - 1910 and Index cases, Noxubee County Historical Society, Macon, Ms., 1990, Lowndes County Library. [S3188] Library of Congress, Chronicling Amercia - Historic American Newspapers. [S73] Daughters of American Revolution (DAR). [S90] Lewis, William Terrell, 1811-1893. Genealogy of the Lewis Family In America: From the Middle of the Seventeenth Century Down to the Present Time. Louisville, Ky.: Pub. by the Courier-Journal Job Printing Co., 1893. https://hdl.handle.net/2027/wu.89062356233, Hathi Trust Digital Library. [S64] Judge H. W. Foote, Planter's Journal of August 1884, John A. Tyson, (n.pub.). [S3216] Biographical and Historical Memoirs of Mississippi: Embracing an authentic and comprehensive account of the chief events in the history of the state and a record of the lives of many of the most worthy and illustrious families and individuals. (1891). Chicago: Goodspeed Pub. Co. https://hdl.handle.net/2027/chi.102898824, Hathi Trust Digital Library. [S20] Friendship Cemetery, Columbus, Lowndes County, Mississippi. [S39] Oddfellows Cemetery, Macon, Noxubee County, Mississippi. [S3139] The Macon Beacon, Macon, Mississippi, January 28, 1927.